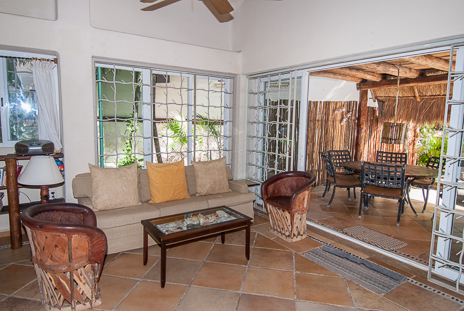 Step off the first floor patio onto the sandy beach! 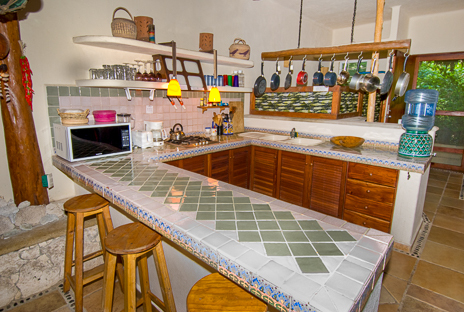 3 complimentary meal preparations (cooking, service, and clean up) included in the rental rate during a minimum stay of one week (7 nights) or more: either breakfast or dinner service are available and meals are prepared by chef Jerry. Cost of groceries/food is not included. Chef tip is not included. Guests will plan meals upon arrival at the villa with the chef, and provide him with money in advance for the cost of groceries. Jerry will do shopping and charges a US$25 per trip delivery fee, and will return with receipts for the groceries. Rates are in US dollars based on 8 guests. Max 10 and 1 child in the main house. 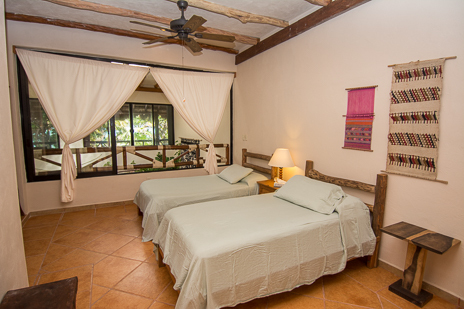 Holiday and high season reservations require a 7 night minimum, Sat. to Sat. only. 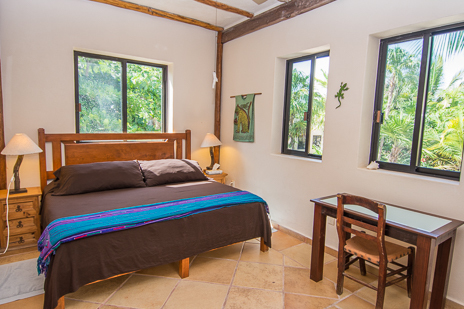 Mid and low season require minimum of 5 nights unless otherwise agreed. 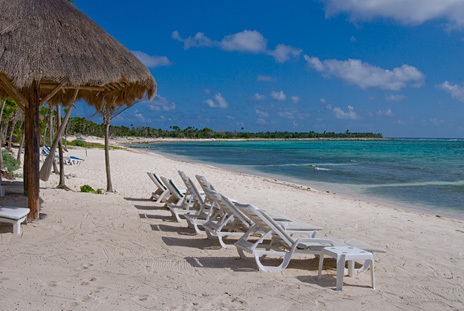 Here's a slice of paradise at an affordable price. 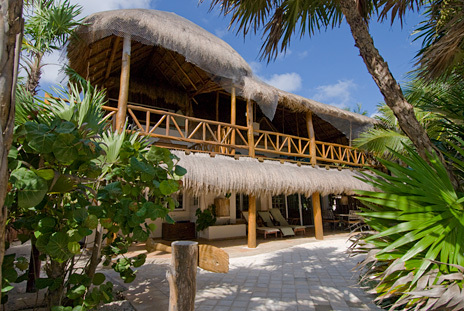 Casa Yamulkan (also known as Casa Zazil-Ha) vacation rental villa is just 40 feet from the water's edge on an incredible sandy beach along Soliman Bay. 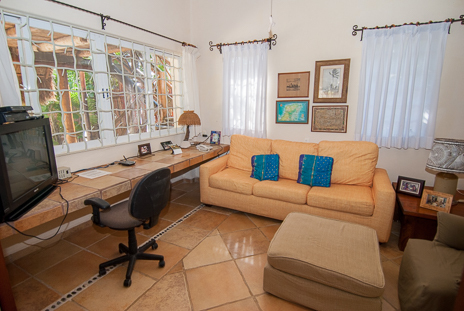 This kickback, comfy vacation rental home is a tropical treasure on Soliman Bay, a private palm-fringed crescent shaped bay that is perfect for snorkeling and kayaking. A barrier reef protects the bay keeping the water calm and making a perfect haven for tropical fish and other marine life. Outdoors is where you'll want to be and you'll find plenty of comfortable spaces. 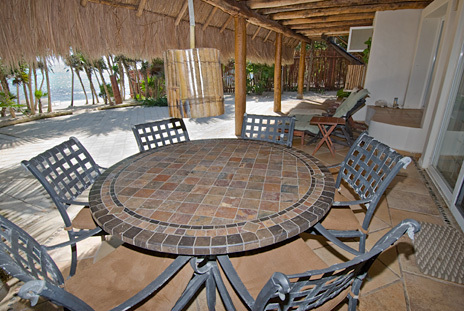 Choose the beachfront terrace fronting the full length of the villa; is is furnished for outdoor dining as well as lounging. 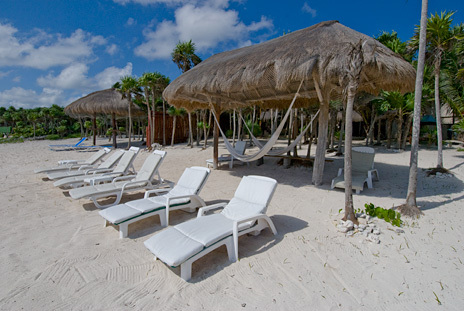 Or slip into a hammock or lounge chair under the shade of the palapa on the beach. 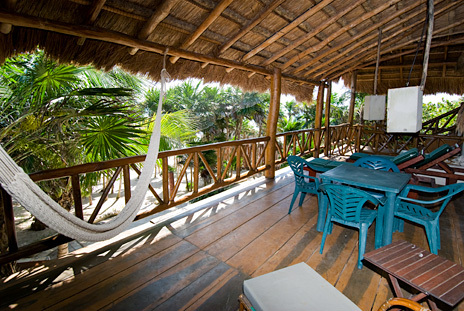 The main level includes a fully equipped kitchen, dining area and living area; access the oceanfront terrace from this area. 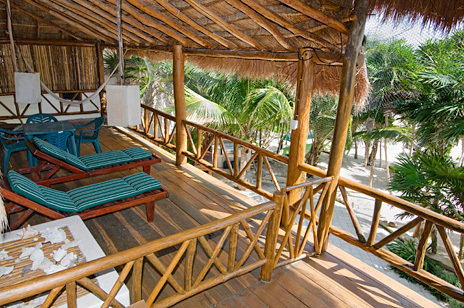 The spacious main level seems ever more so with soaring 18-foot palapa roof. 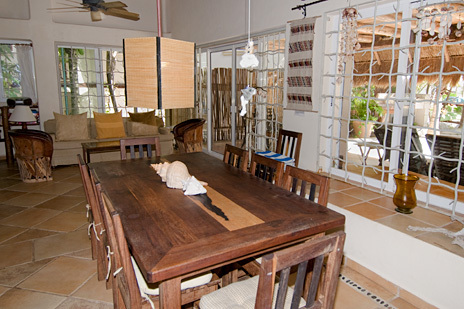 Also on the main level of this Soliman Bay vacation beach rental are 2 air conditioned bedrooms. 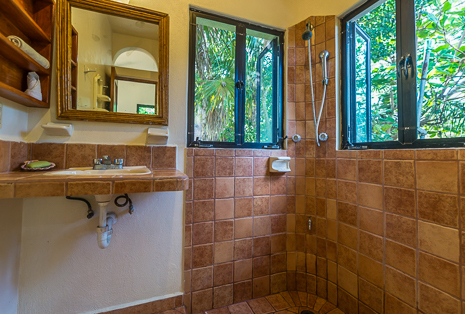 Each of these 2 bedrooms has a king bed, air conditioning and private bath. In addition, on the main level is a television room which can double as a sleeping room for large groups. Here you can enjoy the SKY satellite television programming, or listen to music on the CD player. Internet is accessible with pre-paid connection cards available at the house. 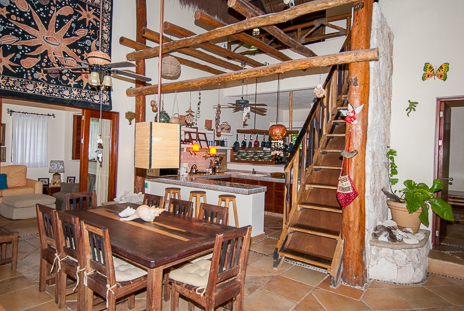 On the second level are three additional bedrooms. 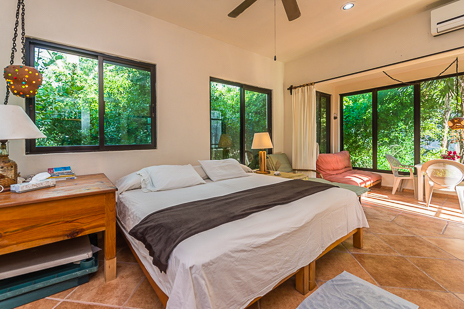 Two of these bedrooms overlook the living/dining area on the main floor below. 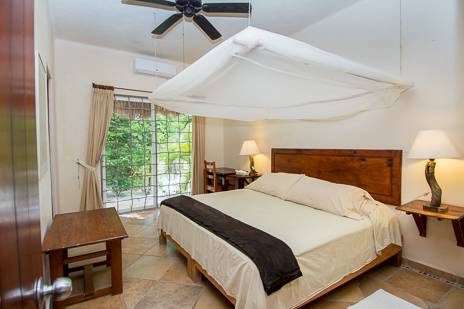 Views are the emerald green vegetation and coastline in the distance; both bedroom areas are furnished with ceiling fans. Between the two sleeping areas is a bathroom. 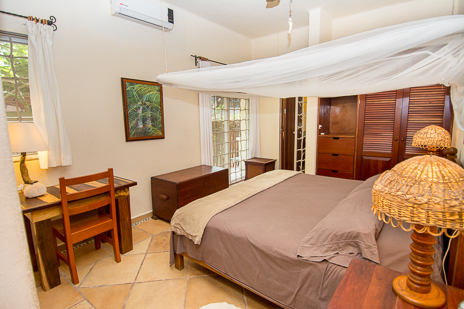 There is also an additional sleeping area for two guests with its own private entrance and is detached from the main living area. It is located up the outside stairway leading to the veranda. 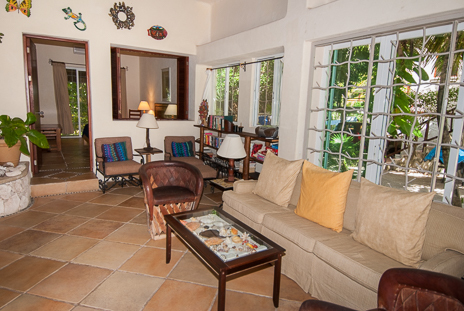 This room is private for guests seeking a little solitude from the main house. 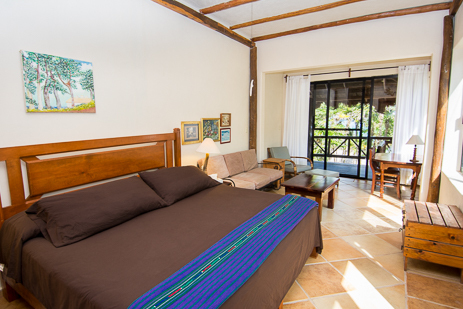 The apartment is furnished with king bed, table and chairs, bathroom with shower. 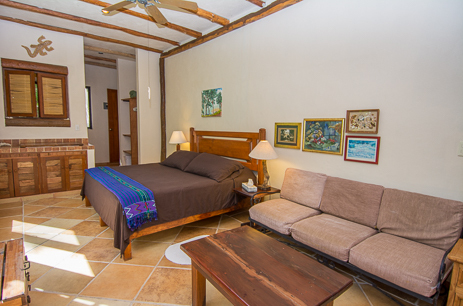 This room offers a nice view of Soliman bay beach with large windows that catch the breeze. There is a ceiling fan but no air conditioning. 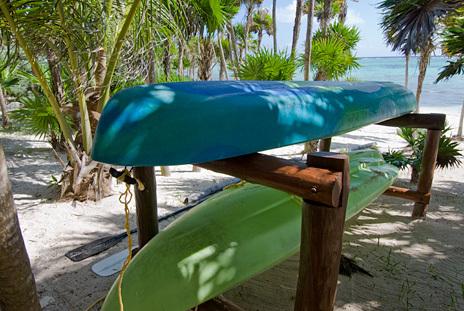 There are two kayaks for those who want to be energetic, and two charming dogs who come with the house. 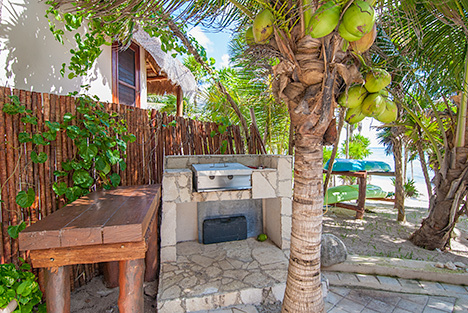 A new gas grill is also available for guest use at this comfortable Soliman Bay vacation beach rental villa. 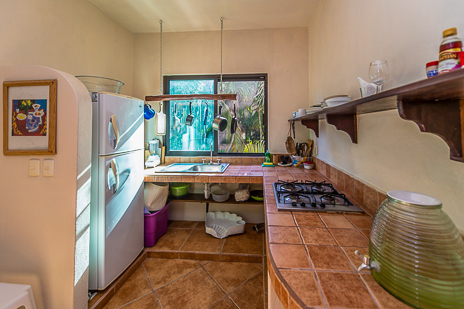 Casita kitchen has a refrigerator, stove, coffeemaker, etc.